Nature’s Sunshine Solstic Energy helps reduce fatigue, increase mental focus, boost metabolism, and supply energy to the body. 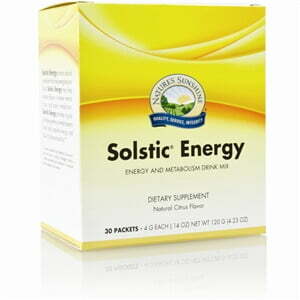 Unlike mainstream energy drinks, Solstic Energy uses natural nutrients for energy. Instead of being loaded with sugar, Solstic Energy is sugar-free, being sweetened instead with stevia and flavored with natural lemon, mandarin orange and pineapple powders. Like all Solstic products, Solstic Energy comes ready-to-use in a convenient stick packet. 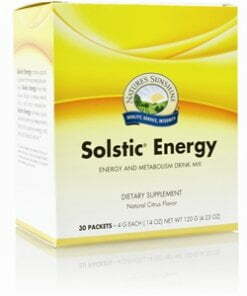 Nature’s Sunshine Solstic Energy contains 60 mg of natural caffeine from guarana seed extract. It also contains thiamin, riboflavin, niacin, vitamin B6, vitamin B12, pantothenic acid, potassium, Korean ginseng root extract, stevia leaf extract, grapeskin extract and green tea leaf extract. NOTE: Too much caffeine may cause nervousness, irritability, sleeplessness and occasionally rapid heartbeat. Not recommended for use by children under 18 years of age. Instructions: Use product as a temporary source of energy. Empty the contents of one Solstic Energy packet into 14-16 oz. of cold water, shake, and enjoy! scFOS (short-chain fructooligosaccarides), citric acid, natural fruit flavors (lemon, mandarin orange and pineapple), natural citrus sweetener, guarana seed extract (Paullinia cupana), Korean ginseng root extract (Panax ginseng), malic acid, silicon dioxide, stevia leaf extract (Stevia rebaudiana), grapeskin extract (Vitis vinifera), and green tea leaf extract (Camellia sinensis).